12.5" RCOS @ ~f/9 (2880 mm fl) Shown at 0.85 and 2.24 arcsec/pixel. 6/12/2015 to 6/17/2015 Chino Valley, AZ... with CCD Commander & CCDSoft. AOL guided. eXcalibrator v4.36 for (g:r) color balancing, using 131 stars from the SDSS-DR9 database. PixInsight processing includes registering and stacking the luminance, gradient repair, non-linear stretching with HistogramTransformation, LRGB creation and HDRMultiscaleTransform. The field of view is shown rotated 25° clockwise. This interesting group of galaxies is in the constellation Draco. Near the bottom, at a distance of about 52 million light-years, is the lenticular galaxy NGC 6340. It is most likely formed by the collision of two, possibly a spiral and an elliptical, galaxies. Partially visible in this image, is a faint dust lane that extends through the core. To the upper-right is the blue galaxy IC 1251 at a distance of about 52 million light–years. At the upper left is the barred spiral IC 1254, at a distance of about 55 million light–years. The galaxy has a large faint plume, indicating an interaction with another galaxy. 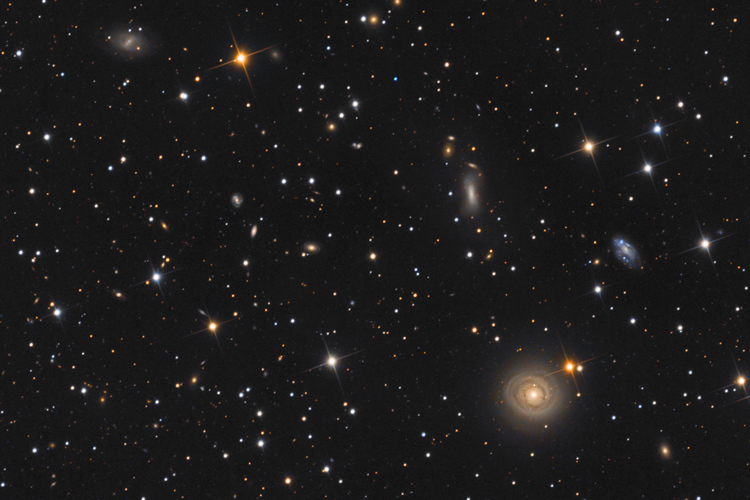 To the far upper-left is UGC 10791 at a distance of about 57 million light-years.